Most swimmers begin their butterfly pull by moving their hands sideways and away from the body. 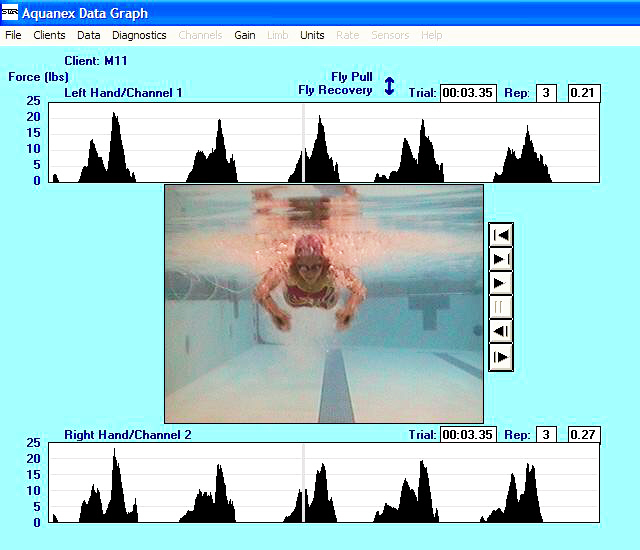 The university male swimmer in the video image below is a typical example. Note how the Aquanex analysis shows that after one-quarter of a second, he is still only generating about 4 lbs of hand force. In contrast, the high school female swimmer in the image below flexes her elbows to begin her pull. Because her arms are immediately in a stronger position, she is generating three times as much force as the much stronger, male swimmer above.